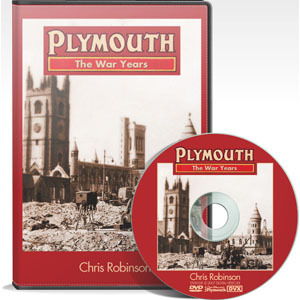 A fantastic collection of Chris’s 3 DVDs covering life in Plymouth at the start of the 20th Century, up to and including World War II. Includes Life in the 1920s & 1930s, Before the War, and The War Years. 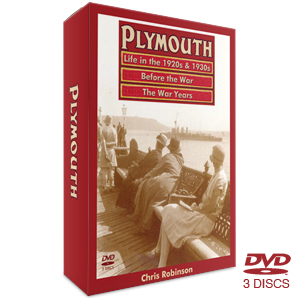 Plymouth The War Years features footage of the visits of Churchill, the King and Queen, HMS Exeter, and of course of the Blitz itself from the Imperial War Museum, British Film Institute, Movietone, Pathe, Reuters, the Huntley Film Archive and Jill Craigie’s ‘The Way We Live’. Together with some fifteen minutes of previously unpublished contemporary local film material, this video brings to the screen for the first time ever the whole moving story of Plymouth from 1939 through to 1945. 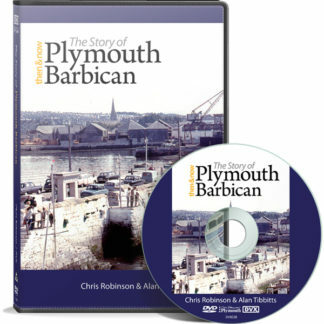 Plymouth Before The War for those unfamiliar with the title, is a street-by-street tour of the Three Towns – as thoroughly as images allowed – with thrilling clips of the Hoe and Barbican, Derry’s Clock, the old, old Drake Circus, Bedford Street, Wolseley Road, and Ker Street. 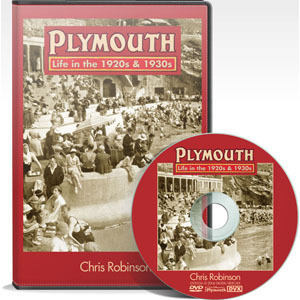 Plymouth Life in the 1920s & 1930s meanwhile is an entertaining celebration of the way we lived in those heady days; with the Hoe Pier & Bandstand, trams and buses, early airplanes and luxury liners, charabancs and motor cars with running boards … and bicycles built for two. A pre-TV world where people mainly made their own entertainment and were happy to venture out of house and home for fetes, fairs and other outdoor amusements.